Toronto Hydro customers, please listen up! Did you know you can simplify your billing with Toronto Hydro? They have the option for customers to go paperless with eBills. This is where you receive an email with your bill instead of having to wait for it to be delivered by Canada Post. It’s simple to make the switch! When you sign up for eBills, you’ll receive an email every month to let you know that your eBill is ready to view online. 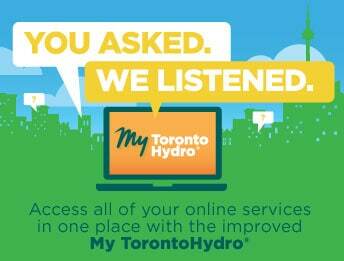 Log into your My TorontoHydro® account and review your bill at your convenience. You can pay your bill online at your financial institution or use Toronto Hydro’s convenient Pre-Authorized Payment Plan. I personally prefer eBills over getting a paper bill in the mail. I find it easier to keep tabs on my current bills. I put them in their own email folder so I know what is due and then record the payment in my own free Google spreadsheet. If a business has a paperless option, I always take it! Paperless eBills save time money and energy! Here are several good reasons why they are a smart choice. 1. 24/7 Access. You can view your account from anywhere and at anytime. All you need is an Internet connection! 2. View Account History. Access all your bills for the past two years in your account. This feature is great if you have a home-based business and are preparing your income taxes for the previous year. You don’t have to worry about losing your old bills. 3. Environmentally friendly. There is no paper waste with eBills. In fact, there’s really no waste at all when you think about it. 4. Less Paper Clutter. I’m pretty organized, but my downfall is paper clutter. I have a shelf in my kitchen where it piles up waiting for me to file. I never seem to find the time and I hate this eyesore in my kitchen. Reducing paper clutter is a big reason why I like eBills! 5. Sign Up Incentive Offer. Sign up for eBills and receive a FREE bottle of Fleecy*Fast Dry™ concentrated fabric softener AND a chance to win a Samsung high-efficiency washer and dryer! This offer ends on June 30, 2015. Ready to sign up for eBills? Visit Toronto Hydro now to sign up. You’ll receive a FREE bottle of Fleecy*Fast Dry™ concentrated fabric softener plus be entered to win a Samsung WF5600 front-load steam washer and DV5600 front-load dryer. Sweet! Connect with Toronto Hydro on Twitter and Facebook.